HONG KONG, China (CNN) -- The United States on Wednesday called for more transparency from China on the arrests of four mining employees, including an Australian national, on charges of stealing state secrets. 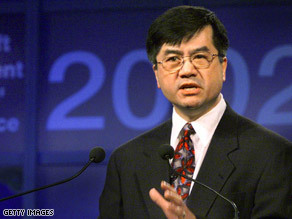 U.S. Commerce Secretary Gary Locke urges for greater transparency in China. U.S. Commerce Secretary Gary Locke is raising the question with Chinese leaders, including Premier Wen Jiabao, with whom he is to meet Thursday in Beijing. "These are of great concern to U.S. investors and multinational companies from around the world that have projects here," Locke said in an interview with CNN's Andrew Stevens. Locke and U.S. Energy Secretary Steven Chu are in Beijing for talks on increasing cooperation between the nations on the sale of clean energy technology to China. The meetings come as international concern grows over the detainment of the employees of Rio Tinto, the world's second-largest mining company, and its possible effects on doing business in China. "We've had good dialogue so far, and we just need to continue to press the issue, to raise the issues of transparency, fairness ... and, of course, fair treatment of employees of companies from America and around the world that are working on these projects here in China," Locke said. Asked whether China has said what will happen next with the arrested employees, Locke said, "We have not received any indications yet." State-run China Daily reported Wednesday that Rio Tinto -- which is co-listed on stock exchanges in Australia and England -- bribed executives from 16 of China's major steel mills to obtain industry information. Rio Tinto has denied the accusations. The company recently was involved in annual negotiations about supply contracts with Chinese mills. The arrests come a month after Rio Tinto broke off a more than $19 billion investment deal with China state-owned Chinalco. In Beijing, Locke spoke of the importance that U.S. companies place on China's markets. "They see great opportunities in China -- opportunities that are win-win," he said. As an example, Locke cited his trip. "Helping build power plants here in China (creates) thousands and thousands of jobs in terms of engineering and manufacturing in the United States," he said. It addresses "the huge energy needs, alternative energy, energy efficiency needs and climate change challenges of China." "But clearly we need to continue to promote those good working relationships and increase opportunities for companies to do business in China," he added. Locke couched the energy needs of China in terms of reducing greenhouse gases ahead of climate talks later this year in Copenhagen, Denmark. "We're talking about the need for collaboration, to resist the efforts of protectionism," he said. "While we're all trying to boost our employment within our respective countries, Mother Earth doesn't have the luxury of time," Locke added. "All of us, all around the world, developed and developing economies, must be fully engaged with regards to climate change. "The U.S. is the largest emitter of greenhouse gases per capita, or per person, around the world. China, of course, with its larger population, is the biggest emitter," he said. "Whatever we're able to do in Copenhagen, China must be involved, or all the efforts of developed nations will be for naught."